With increased interest in travel and people becoming more conscious about their well-being, a new wing of travel has emerged and is gaining a lot of popularity with time i.e. Spiritual Travel. Some people travel to exotic places and some to spiritual, the motive is to attain containment but Spiritual Travel is more about out of body experience taken voluntarily to cleanse their heart, mind and thoughts. I am more into exploring new places whether exotic or spiritual and they both give me a sense of happiness. Spiritual mainly for covering the architecture. But when I visited Gaya in March 2014 with my family it was for pind daan of my grand parents. In Hinduism, Pind Daan is a mandatory ritual which is to be performed post death. It is believed that Pind Daan gives an ultimate relief to the departed soul and paves way into the world of peace. Gaya is mentioned in great epics like Mahabharata and Ramayana. It is in fact believed that Rama along with Sita and Lakshmana had visited Gaya for offering pind daan to their father Dashratha. Our trip was not just limited to Gaya but was a 3 nights, 4 days trip covering Gaya and some places around. Here is a comprehensive list of what you can cover in this duration. Vishnupad Temple - The place with Lord Vishnu's footprint. Vishnu-pad literally means feet of Lord Vishnu. The temple is located along Falgu River (which carries water only during monsoon) and is marked by the 40 cm long foot print of Lord Vishnu, imprinted on basalt and the same lies in the centre of the temple. The construction date is unknown but is believed to be visited by Rama and Sita. The structure which we see today has been rebuilt by the ruler of Indore, Devi Ahilya Bai Holkar in 1787. The temple is built of large gray granite blocks joined with iron clamps. It is 30 m high and has 8 rows of pillars which support the pavilion. There is a banayan tree (Akshay vat, which is believed to be blessed by Sita to become immortal) within the temple where the final rituals of the dead takes place. Sita Kund - The place where Sita paid homage to Dashratha for his peace. Opposite Vishnupad temple across Falgu river, this is a small temple where it is believed that Sita performed pind daan for Dashratha. While Sita performed pind daan in the form of sand balls, Dashratha hand appeared to accept the same. You can see the hand too. Mangla Gauri - One of the 18 Maha shakti peeths. Built on top of the Mangalagauri hill, the temple can be reached by vehicle and walking both. The temple is dedicated to Sati and it is believed that her breast fell here and is a symbol of nourishment. The temple is very small and only 2-3 people can go inside at a time. Its pretty hot inside and lack of oxygen which I felt. A must visit when you go to Gaya. The place where monks reside. The place which not only attracts Buddhists but people from other religion, caste and creed too because Buddhism is not just a religion but a way of life. It is one of the few places in the world where you would not only see different colors of Buddhist monks and the culture but you can live among them. The aura of the place has a calming effect. Bodhgaya is around 16 km from Gaya and has many monasteries. Mahabodhi temple, bodhi tree, thai temple and monastery, tibetan monastery, chinese temple and monastery, royal bhutan monastery, the giant buddha statue etc are within walking distance in Bodhgaya. Bodhi Tree & Mahabodhi Temple - The place which will give you goosebumps. Bodhi tree is the large peepal tree under which Gautam Buddha is believed to have attained enlightenment. The very place where Siddhartha Gautam became Gautam Buddha. 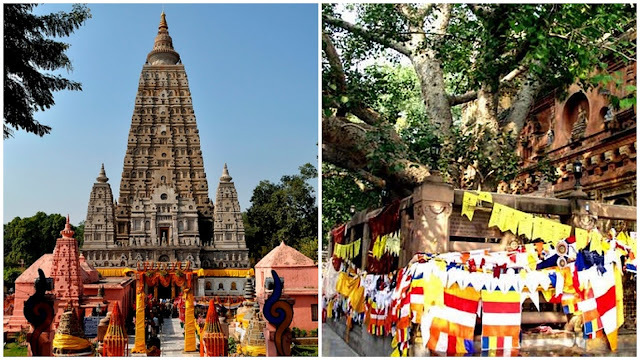 The tree which is actually the descendant of the original Bodhi tree is in the same complex of Mahabodhi temple and the complex is called Mahabodhi Vihar, a UNESCO World Heritage Site. It is believed that 200 years after Buddha attained enlightenment, when Samrat Ashoka came to visit the holy place, it was to establish a monastery. Now the temple we see was actually restored during the 11th to 19th century. Mahabodhi temple is made of bricks and is the oldest brick structure to have survived in Eastern India. Mobile phones ain't allowed inside. Only DSLR if you wanna click picture. Alas! I didn't carry my DSLR so couldn't click a picture myself. For me it was one of those experiences, I consider experience of a lifetime. Truly blissful. The Giant Buddha - The site which gonna leave you in awe. This statue depicts Buddha in meditation pose / Dhyaanmudra sitting on lotus, with statues of his disciples surrounding him. Its 25 m high statue, the foundation of which was laid in 1982. It took 7 years and 12000 masons to complete and is believed to be the largest in India. It is owned by Daijokyo Buddhist Temple and was inaugurated by the 14th Dalai Lama on 18th November 1989. This definitely leaved me in awe and I just clicked clicked and clicked from every angle. One of the 12 jyotirlingas, this abode of Shiva which is also known as Baidyanath dham and Baba Baidyanath is located in Deoghar in the state of Jharkhand. The complex is huge with one temple dedicated to Lord Shiva and as many as 21 other temples built in both old and new styles. It is believed that Lord Shiva cured the injured Ravana who offered his 10 heads one after the other to Lord Shiva and since Lord Shiva cured Ravana as a Vaidya (Doctor), the former got the name, Baidyanath. Millions of devotees / pilgrims visit the shrine every year and as much as 7 to 8 millions during Shraavana. Baidyanath is around 290 km from Gaya and will take around 5 hrs on an average one way via road. In traffic it can be more. Needs one day to visit the shrine from Gaya. You can take the train too from Gaya. Day 1: Reach Gaya early morning, check in hotel. After a rest of 1 hour or so leave for Bodhgaya. Spend half a day there. Come back and visit Mangla Gauri on the way. Back to hotel, rest. Day 2: Visit Vishnupad and Sita Kund, evening you can visit local market, try some local snacks, sweets, lassi. Day 3: Leave early morning for Baidyanath, have darshan. Return by late eve. Rest. If you wanna spend whole day at Bodhgaya you can visit Mangla gauri on the second day too. P.S. 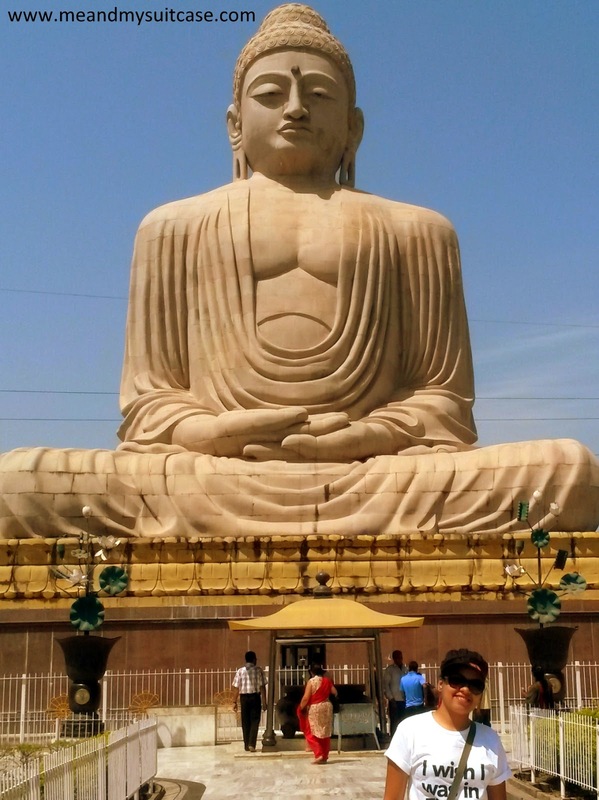 Bodhgaya is one of those places which I wanna visit again and live there with monks for a few days. It has that effect. For more pictures click here. Thank you. You shall definitely do.